As football season approaches, I wanted to share some of my personal feelings on game day etiquette, just in case you were going to be sitting near me or someone else who has very particular feelings on this subject! 1. I paid for my whole seat--you do not get to share it. Why must I even type this? Do not put your random, stranger leg in my personal space. I do not want your sweaty knee touching mine in the 100 degree blazing sun. I also don't want your hip on me--you can scoot over. Your purse doesn't need to sit next to me--it didn't pay for a seat and I most definitely didn't sell it part of mine. OH--and my legs are NOT your back rest. You would think I didn't have to say this but seriously this guy at the Bama v. Penn St. game in State College kept laying back on my legs like they were a recliner. No sir--no thank you. Nothing infuriates me more than a spilled drink at a game. It sounds ridiculous, but nothing can upset the balance of a perfect game more. I mean, you kick that giant drink over, it runs down and affects everyone sitting below you. Now, we are all standing in a wet, sticky mess, which gets splashed when we jump up after a good play--OR--you, the spiller, splash your feet it in and it gets on my back--gross. Now I'm having to hold my purse in my lap because your drink is under my seat, where purses, and my own drink belongs. Some people decide to put their now moistened possessions on the seat next to them, which jacks up everyone else (see number 1). Either buy a bottle, or put your drink all the way up under your seat. It's really not that hard. I know that not all of your teams are lucky enough to be cheered on by 101,000 fans shaking shakers in time with the stadium music, but my team is. You may mock us and call it a pompom, but a shaker is really the best game day accessory. You can stir your drink with the handle (actually, Bama shakers exclusively have skinny handles for this exact purpose), you can pass them out at your wedding and have people shake them as you leave your reception (although, if you hand me another team's shaker at your wedding, I'm not going to shake it, I'm sorry), you can use them to cheer on the team OR slap things with them out of frustration. My shaker and I are inseparable at games. I had to sneak one in at Ole Miss because for some reason they treated them as weapons. Oops. I had my lucky shaker stolen out of the back of my purse in Knoxville in 2010--and the football karma totally got those people because we've beaten Tennessee every year since then. Ha! (sorry Sarah). Anyway, back to the point--if you are going to use the almighty shaker, you need to use it properly. You will NOT hit me or anyone else with it--one time, I'll give you, twice, we have a problem. It's not that hard--just hold your arm higher! Also, under no circumstances are you to shake your shaker after it has been raining or some idiot has spilled their drink all over it (see number 2). When you do this, you shake nastiness all over me, and that is just not cool. When I was little and my parent's took me to games, I wasn't allowed to have a shaker if I hit anyone with it--neither should you--as you are a grown up. Right after this photo, my shaker was taken. I'm going to blame the bald guy behind us. I mean really, we are up by 35 at half--is there any reason to continue to stand during the game? Don't get me wrong--I'll stand and cheer with the best of them. But after some point, I really want to watch the game, not your back. I don't get these people who want to stand the entire game. I did that--it's called the student section. Typically we stand during the first drive or really exciting plays, you know, the good parts. Did you know that when you stand, the people behind you can't see and they have to stand, so the people behind them have to stand, and so on? I'm not trying to be no fun, I'm trying to see the game that I paid to see. If I have to watch it on the jumbo tron, I may as well have stayed home. Therefore, let's consider those around us, please, and also realize that 4th and inches is a reason to stand and that +30 in the 4th quarter is not. It's all about manners, people! I don't have kids so I do not have any idea of how difficult it is to bring them to games, although I will be bringing my future kids to the games when I think they can handle it. I do think it's a little nuts when people bring their infants to the hottest game of the year (aren't you hot, holding them through out the whole game?-- although, I guess if you are a nursing mama, you have to. I mean, baby gotta eat and mama gotta watch the Tide play, right?) but in general I love seeing kids at games. I think they are darling all dolled up in their game day finest and usually if they spill on me or hit me repeatedly with their shakers, I'm going to blame who ever is with them, not the child, because hello, they are children, and hitting people with shakers is fun. I typically don't care if your kid is climbing on me, going to the restroom 8 million times, forcing me to get up each time, or if they are spitting Skittles into my hair (yep, true story). What does bother me is when it is an important game, during a pivotal play, and these things are happening and the parent is too wrapped up in said important game or play to notice that I am not watching the game because their child is hanging off the upper deck and I'm the only one who is trying to stop him from plummeting to his death. 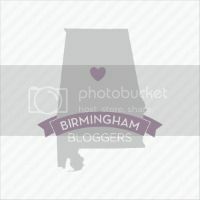 I don't begrudge the adorable boys dressed like mini fraternity boys in their baby Sperry's and Bama polos, or the precious little girls with smocked dresses and Bama bows in their hair, the experience of an Alabama game. 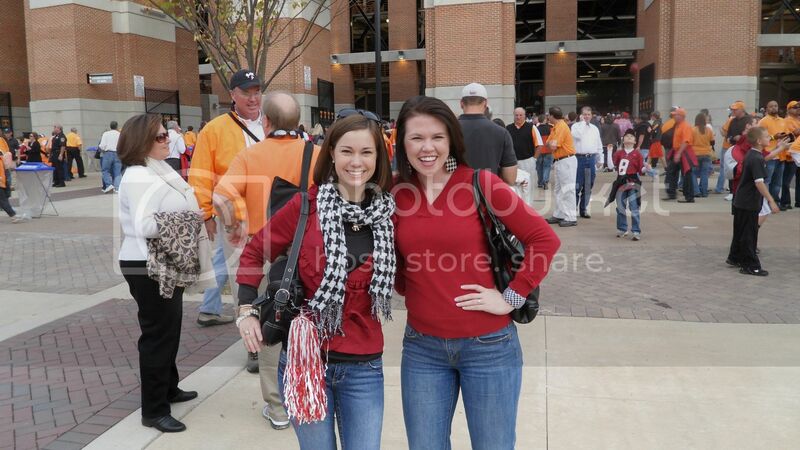 Heck, I went to my first Bama game at the ripe old age of 4. What is annoying is when these kids are doing their kid things and no one is paying attention to how they are affecting those around them. I'm not talking your Bama v. Western Carolina kinda games (sorry if you are for them--but you understand), I'm talking Bama v. Texas A&M, LSU, etc. And clearly, I didn't care about any of this when Bama sucked--spill your drink on me kid--it will give me something else to deal with than the reprehensible activities going on on the football field. But if the teams are good and the game is requiring your undivided attention, please don't bring your kid and expect someone else to watch them. It's not fair to me and it's really not fair to your sweet little child! 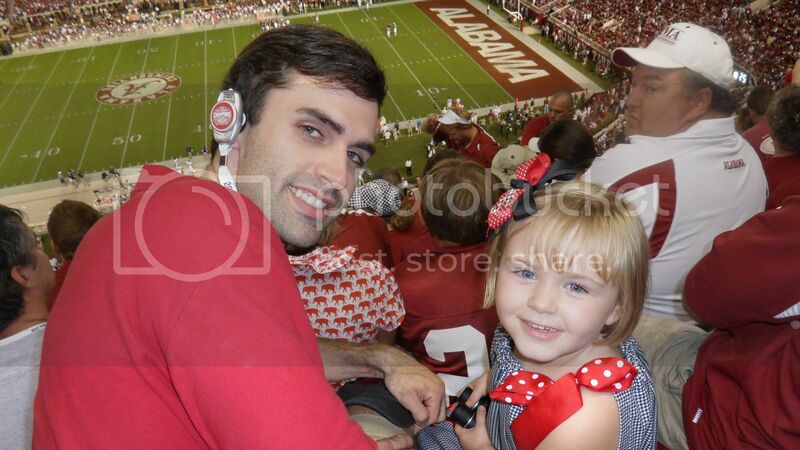 Forrest hanging with Emily Ann, the sweet little girl who sits behind us at games. She is so cute and well behaved, plus she will brush your hair during timeouts! I don't care if we are up by 50, you need to be respectful. I don't care if we are losing by 50, you still need to be respectful of everyone around you. Yes, be elated that we slaughtered that team and by all means, rain down your frustration that we lost in over time at the last second. I'm right there with you, but really, you need to keep it in check and not let yourself become a burden or nuisance to those around you. That's really what this list is about. I know that football games are all about fun and shouting and high five-ing, but when you are squished in with thousands of your fellow fans, you need to understand that you are not the only one there trying to enjoy the experience. Watch your mouth if children are sitting next to you, if you get drunk and are screaming or falling or slurring or harassing people, someone is going to get the cops, and you shouldn't wonder why. If you have little kids, make sure they aren't ruining someone else's game experience that they paid good money to see. There is no need to cheer when a player is injured (excuse yourself, Florida fans, for cheering when Tyrone Prothro got hurt in 2005, shame on you) and there is no reason to make a spectacle out of yourself when something goes right or wrong (Dear LSU cheerleader--there was no reason to call me a "B" when I was cheering on my team during the last seconds of a tough game--especially since you were on the field in your uniform--true story). Have fun, dance, drink to excess, scream, cry, hug strangers, but, understand, that everyone is there to have fun, and your actions just might ruin that fun. I'm not advocating Emily Post's manners, just a general awareness of the other fans around you. Ok, thoughts? Am I way off base here? This is probably another reason I'm officially old. What are your game day pet peeves? Very well written article. I wouldn't expect anything less from a McCord. You're points are valid, yet a little optimistic. You can't really expect all drinks from getting knocked over. Most of my drinks that ever got spilled, was from that woman who is carrying her kid somewhere for the 10th time in the first half. Steer clear of the cheap seats where all of us rednecks sit lol. RTR! I can't stand when you have the idiot that is screaming to "rip their heads off"...seriously...because football is all about pulling body parts off. While I am not an obnoxious fan it kills me when I sit next to some women in the alumni section and she is upset because I am cheering on my team to loudly in her delusional opinion. :) Oh..and I hate spilled soda...and why does it always get on me?? As for kids...we have four and they know what we expect from them at the game. Anything less then that they will be in a mess of trouble when we get home. SIC 'EM BEARS!! A shaker? I just learned something new. As for everything else...yeah. Eww. I consider myself southern at heart, but I will give credit to Maryland for one thing - I never experience those problems at Naval Academy football games! I'm with you 100% on all of these. I think kids are okay to go to day games, especially the noon time kick offs. But crazy parents to bring them to night games! How hilarious would it be if it turned out I was the one who took your shaker?? ?